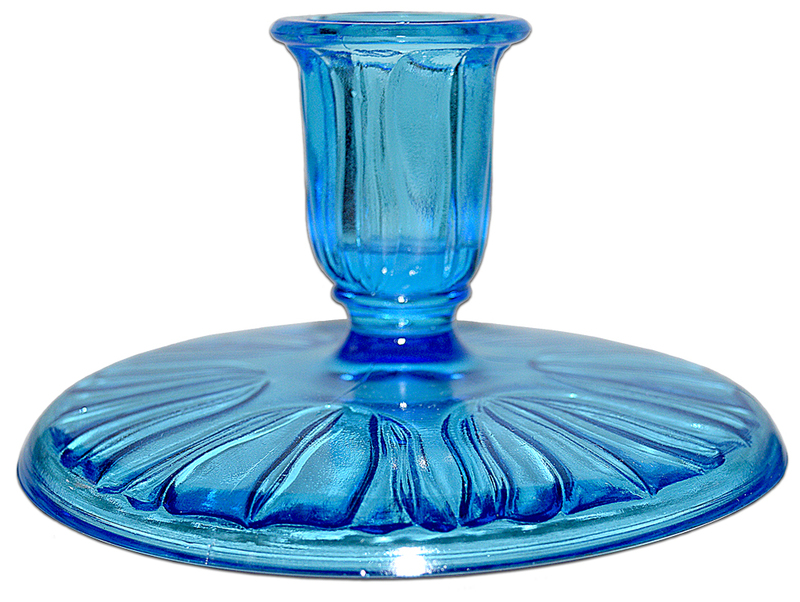 Condition: Our pretty Dell blue candlesticks are in UNDAMAGED CONDITION without chips or cracks. They are free of disfiguring mold or production imperfections. The color is fantastic. The pattern is well defined. Measurement: 3" H. - 5 1/4" W.
The Dell Glass Company: Dell produced hand made decorative and utilitarian glassware in their Millville, New Jersey facility during the 1940's. The sales representative for the company was Claude M. Sperling. Showrooms were located in New York City and Los Angeles. Stylistic ashtrays, candy jars, lamps, decanters and other beverage items were important Dell contributions to the glassware trends of the era. Production of Dell's colored Tulip dinnerware pattern appears to date from the mid to late 1940's. Advertising for this pattern appears in 1945 leading ladies magazines and in the Montgomery Ward catalogue. Although it is not known exactly what happened to this company, trade journal references and advertisements for their products disappeared by 1950. Merchandise is guaranteed as stated in the description. All items are carefully examined before listing & again before they are packed. If any errors are made in the representation, a full refund will be issued upon return of the item. Approval for returns must be obtained within three days of receipt of item. Items must be returned via the same manner in which they were shipped. If you wish to ship in another manner, other than the one we have provided please get in contact with us..